Last Friday was a big day for celebrating entrepreneurship in Canberra. 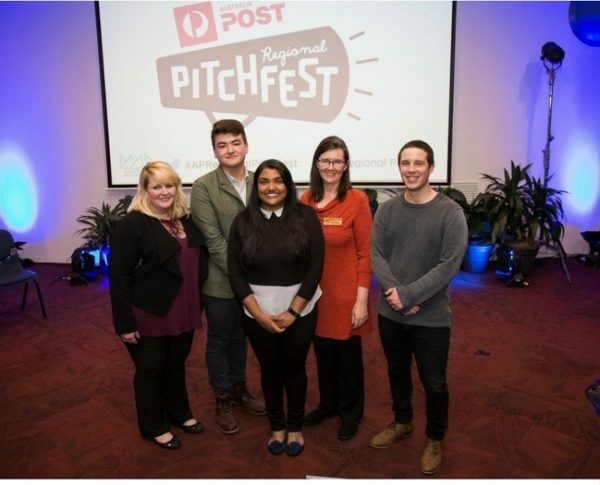 Australia Post’s General Manager Small Business, Rebecca Burrows, founder of RegionalPitchfest, Dianna Somerville and the Melbourne Accelerator Program (MAP) held two big events in Canberra. Both events were winners in my book. They were inspirational and pitched (pardon the pun) at our local community’s own entrepreneurs. The Tall Poppies business breakfast was hosted by Canberra Women in Business and held at our beautiful National Gallery on Friday morning. Through a panel discussion, we heard the stories of four regionally based entrepreneurial women. Ultimately, it was like an injection of adrenaline into the veins of like-minded business women who attended this event! The buzz in the room was palpable. Why? Because the four guest speakers not only had interesting stories, that were engaging and inspiring, but they also shared the ‘warts ’n all’ side of growing a business. Business storytelling at its finest! It turns out, like many others, they had all started their ventures from a burning need to do so. Some, when their backs were against the wall; some with a serious marriage breakdown; another where a corporate employer had not done the right thing; or they felt like they were the square peg not fitting into that round hole, and so they had to create themselves a job. This is how many business ideas germinate when life serves you cr@p, and you turn it into manure. There was much laughter in the room and a fair bit of wonder and admiration too, judging from the questions and the feedback that came out of this lively panel discussion. The panellists were Hayley Purbrick, business owner of Big Sky Ideas; Irene Falcone, of Nourished Life; Krystal Kinsella, Director of Indigenous Services; and Kylie Travers, CEO of Occasio Enterprises. The event was a forerunner (in a warming-you-up kind of way), to the Australia Post Regional Pitchfest, ACT Finals. The ACT Finals were being held on Friday evening, showcasing the five regional ACT finalists. I had the pleasure of attending both events – and I was so glad I did. At the morning breakfast event, one such finalist sat at my table. It was pure serendipity but not surprising, given that we all know that Canberra is a clever city, a university town, which has unique entrepreneurial ideas emanating from our fine research institutes (a unique advantage I feel, that Canberra has to offer). I was mesmerised by ornithologist, Dr. Debbie Saunders, (her ‘AboutMe’ page tells me she is fascinated by dynamic animal movements and conservation), whose invention has been turned into a viable business. That invention? Would you believe, Wildlife drones! Her research has led her to this invention that is all about robotic animal tracking, and there is much interest already from all around the globe. The future application of this technology is very promising indeed. And another coup for Canberra! The finest researchers, using their entrepreneurial skills to establish businesses that can offer the fruits of their research to the global marketplace, will help to put Canberra on the global map of scientific entrepreneurship. Perhaps, one day we might even rival Silicon Valley, and stop the need to establish our companies there. Australia Post’s General Manager Small Business, Rebecca Burrows, said that the calibre of entries was exceptional and I have to agree! “We were pitched five smart, forward-thinking and innovative business ideas that demonstrated commercial potential to meet real, practical need,” said Ms. Burrows. She was joined on the judging panel by Jane Cay, Founder Birdsnest Pty Ltd; Julie Okely, Founder and CEO of Dilkara Essence of Australia; Rohan Workman, Director of MAP at the University of Melbourne; and Mitchell Harmer, CEO of SignOnSite. I am so glad that I didn’t have to judge this event because all of the pitches were great and even voting in the People’s Choice was a difficult decision for me. But the winner was, Nipuni Wijewickrema, from GG’s Flowers. Nipuni not only took out the award by the judges, but she also took out the People’s Choice award. It’s a social enterprise above all else, that is set to impact positively on the lives of many others. The Australia Post Pitchfest national final gala event will be held on Friday 18 August in Wagga Wagga (NSW). The winner will be awarded $7500 plus a MAP Silicon Valley trip to the US and an Australia Post eCommerce Growth Pack. The runner-up will receive $5000 and the Community Choice Award winner $3000. For national gala event and ticketing information visit http://www.regionalpitchfest.com/. I am planning to go along to see how our own GG’s Flowers fares, and to soak up the ambience of a room full of inspirational entrepreneurs around the country! It should be an enormously inspiring event. Are you tempted to come and join me?